As the memory of grapes, greenery and growth fades, squadrons of vines now stand rigid on frost (or even snow) covered slopes. With the buzz of harvest now also a distant memory, the sticky fingers, fifteen hour shifts and stiff backs are now traded for a time of eagle-eyed attention to detail within the winery. Directly after fermentation, a young wine will usually come across as rugged. In order to refine and improve a wine’s overall profile, the maturation process is key. It is, in effect, the sandpaper used to smooth and tame the product into something ultimately more rounded and complex. Winemakers use a variety of vessels to mature their wine and this is a decision based entirely on the style of wine they are trying to create. 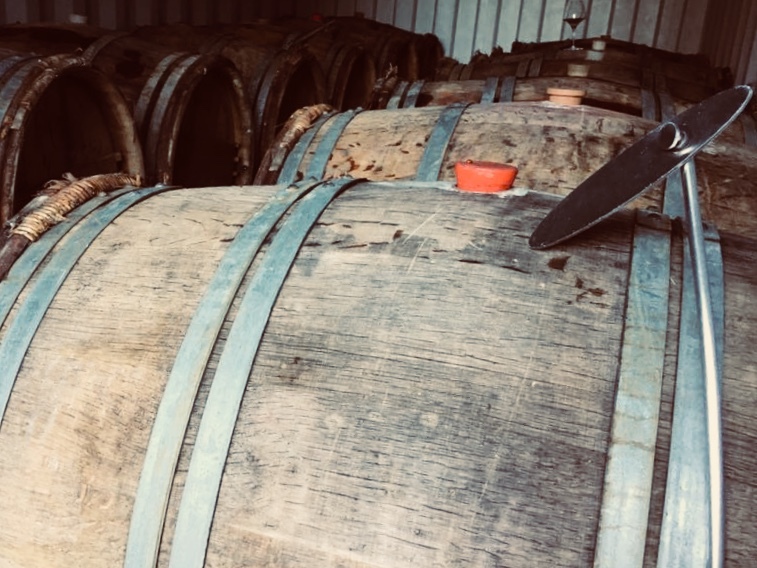 Oak barrels have long been a popular choice due to their ability to impart unique aroma and flavour profiles - think smoke, vanilla, toast and spices. As a naturally porous material, oak will allow small amounts of oxygen into the wine, thereby developing further structural and textural complexity. A selection of French Oak barrels being used to mature English wine. Whereas most, if not all, English reds are matured in oak, some whites might not see any oak at all. Instead, stainless steel tanks are used. These inert vessels impart no extra flavour to the wine and therefore usually result in an end product which has retained many of the delicate fruit-driven characteristics. Stainless steel vats in Dorset. This is the process of moving a wine away from any sediment that has settled to the bottom of the tank after fermentation. Known as the ‘gross lees’ these dead yeast cells and other particles suspended in the wine will form a layer at the bottom of a vat or barrel, with the newly fermented wine sitting on top. There can be elements in the gross lees that could throw off some unwanted flavour or aroma profiles. A winemaker may wish to separate their wine from this sediment and to do this they ‘rack’ the wine by simply transferring it to a new vessel while leaving the gross lees behind and undisturbed. Once in the new vessel a ‘fine lees’ will form at the base from any remaining yeast cells and this will help to keep the wine fresh until the winemaker feels that they are ready for blending or bottling. This age old technique involves the periodic stirring of lees (yeast cells) back into the wine. Inserting the baton into the barrel and stirring the lees like this is a way of adding extra flavours and a richer, silkier texture as well as keeping the wine fresh. Usually reserved for white wine production, it is of paramount importance that the wine is not over-stirred as this could result in the trademark English fruit profile being masked. A baton - a tool designed for bâtonnage. Coined by whiskey distilleries, the Angel’s share refers to a percentage of liquid which inevitably evaporates away due to the oak barrels being porous. When wine is matured for long periods of time, wine also evaporates in the same way. An important job is the topping up of barrels as a means of replacing any wine which has been lost. Whilst an element of oxygen contact is desired for flavour, too much can result in the loss of cherished fruit characteristics and oxidized flavours, hence the need for topping up. Topping up the angel's share. The bacterial culture used for MLF. This process will make a wine appear to be less ‘acidic’ whilst adding a creamy, buttery even oily texture to the palate. This can take place during or after the alcoholic fermentation. The aim of this process is to alter the acid profiles within the wine. By maintaining a temperature around 20 - 25 degrees, if necessary adding a bacterial culture, a winemaker can change the Malic Acid (same acid found in green apples) to Lactic Acid (which is found in milk). This is mostly common at this time of year when making a wine with residual sugar. If a winemaker is producing a sweeter style of wine then they will want to prevent any natural yeast from fermenting the remaining sugar. By filtering the wine through a microfilter into a completely sterile holding vessel then there will be no way of any yeast interacting with the wine and starting a second fermentation. Setting up a pump for micro filtering. 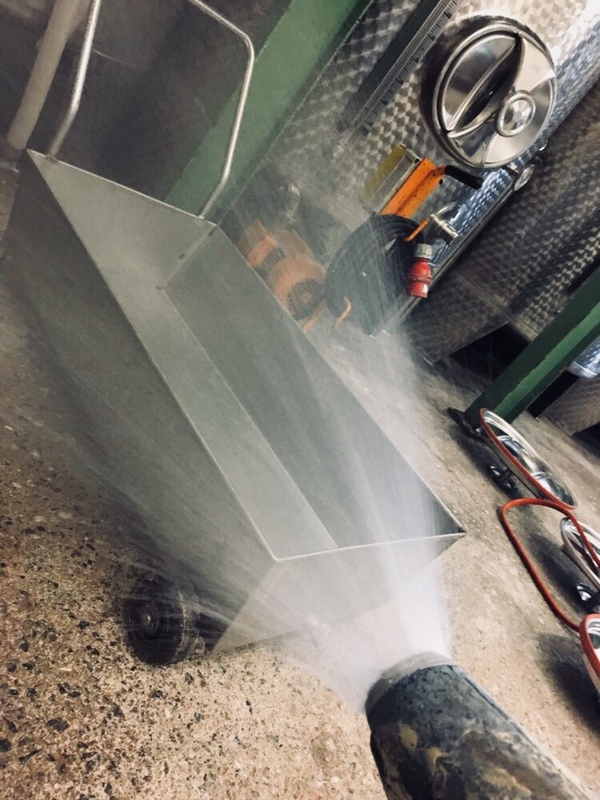 While half of the winery machinery is out of action, the winery crew have a chance to give their equipment and winery a full clean down from head to toe. It is important to ensure that all of the equipment is functioning properly in order to avoid imparting any unwanted flavours or aromas on the wines. A clean down action shot. Tasks amongst the vines are certainly at their least frequent during the winter months. The task of pruning, however, is vital to the overall quality and quantity of the fruit production of the vines. Secateurs (pruning scissors) are used to cut back and trim dormant vines, after their leaves have been shed.The reason vineyards stall pruning until after leaf fall is so the carbohydrates and minerals from the leaf have had time to transfer into the permanent, woody structure of the vine. Ultimately, by regulating the number and positions of shoots on a vine, the vine is able to channel its energy into new growth in the Springtime. As a result, fruit quality and bud fruitfulness are all improved. Freshly pruned vines in Devon. The run up to Christmas can be a manic yet brilliantly festive time for many cellar doors across Britain. With many Brits deciding on gifts and stocking up their cupboards for festivities, this period is dominated by cardboard boxes, parcel tape, Christmas hampers and delivery deadlines. Many cellar doors may find themselves quiet (compared to summer) due to the tucked away, sheltered locations of most English vineyards however online sales certainly help to balance that. With wine-tourism on the rise, Christmas is also a time for cellar doors to host specialised tasting events and tours. From pop-up foodie events to tastings with a Christmas twist - English Wineries and Vineyards are fast becoming a festive venue of choice!